The St. Joseph's Catholic Parish traces its roots to the mid-1870s when German Catholics arrived in Ellis County. 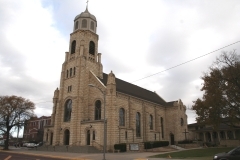 The Romanesque Revival style St. Joseph's Catholic Church (ca. 1904) and Parochial School (ca. 1907) was designed by the Topeka architect Joseph Marshall, who earned a reputation for designing several religious, educational, and institutional buildings. He had also served as assistant state architect between 1897 and 1898. The 2 ½-story church features a gabled nave defined by a tiered tower that rises from the center of the front elevation and corner buttresses with massive spires. Round-arched openings, typical of the Romanesque Revival style, frame stained-glass windows with ornate tracery. The nominated property also includes the Romanesque Revival-style parochial school. The school and church are nominated to the National Register for their architectural significance.